A dental implant may be the cost-effective and long-term solution you are looking for to improve your smile. Have you lost a tooth and need a lasting replacement? Are your dentures irritating you or becoming a nuisance and you would love a more comfortable and convenient alternative? ADDC Dental can help you achieve this with our up to date methods and state-of-the-art technology for dental implants that start from $3000. All of our clinicians received rigorous post-graduate training to receive a fellowship in Implant Surgery from the University of Miami, in Florida, USA. A dental implant is a process used to replace missing teeth and roots with a more natural looking and permanent solution than dentures or dental bridges. A titanium, screw-like implant is inserted into your jawbone in place of where your missing tooth’s root was. The implant is secured into your jaw structure as your bone bonds and closes over the implant and once the healing is complete, you are ready for your new teeth to be secured. The dental implant surgery is performed through several stages and can give you a new smile all in just one day or up to a number of weeks depending on your individual requirements. We use the latest in technology and methods to prepare you for your dental implants. Keep reading to learn more about our advanced methods to give you the perfect dental implant fit or watch the below video for a better visual of the process. ADDC Dental uses Dental Cone Beam Computed Tomography (CT) to assess your teeth, soft tissues, bone and nerve pathways all with a fast and painless, single scan. Cone Beam is a medical imaging technique which consists of an x-ray that provides us with three-dimensional (3-D) images and further in-depth clinical data that we can appraise to help us determine the best treatment plan for you. Using a low trauma technique, if required, your damaged tooth is removed and your jawbone is prepared for any bone grafting treatment that will assist in supporting your implant. We take great care with any extraction and use the latest Platelet-Rich-Fibrin (PRF) methods to aid and speed up your healing process. PRF is a natural, healing biomaterial used to achieve faster outcomes for any bone or soft tissue regeneration. The use of PRF in our dental implant process replaces the outdated methods still used by other clinics. It benefits you by providing rapid results without any inflammatory reactions and can be used to promote haemostasis, bone growth and maturation. ADDC Dental use computer-guided surgical templates designed to save time and increase the accuracy of your dental implant planning, treatment, and surgery. This ensures our processes are minimally invasive and more comfortable for you. We engage digital treatment planning software and surgical drilling templates based on your prosthetic-driven implant plan to cut your surgery time in half and provide you with fewer appointments. This computer-generated technology means that the dental implant surgery is more accurate and the implant placement is better streamlined. If you wear dentures you may have already experienced embarrassing situations in public where your dentures have slipped. Dental implants imitate real teeth and function as per normal which means you can eat all your favorite foods again! No glue is required which eliminates the daily chores of removal, and extra hygiene care that is required to keep your dentures clean. Dental implants are permanently secured to your jawbone giving you 24/7 comfort and peace of mind, which can last a lifetime with the right oral care. As dental implants look natural, your physical appearance is enhanced which leads to greater confidence and a boost in your self-esteem. Dental implants are specially molded and fit snug into your mouth and with the right dental hygiene give you superior oral health. This option provides less chance for plaque to build up and cause tooth decay or gum disease, which can be a cause of ill fit or loose dentures, or dental bridges. Dental implants fill in the space from the missing tooth, complete your smile and prevent your facial features from being altered which can happen due to your jawbone shrinking after loosing your natural teeth. You would like to improve your speech. You have healthy oral tissue and a fully grown jawbone. You have decent bone structure or are willing to undergo a bone graft. You are unable or tired of wearing dentures. You do not suffer from gum disease or bone healing conditions. Our staff take great care and make certain that you leave with a wealth of knowledge on how to take care of your new teeth. 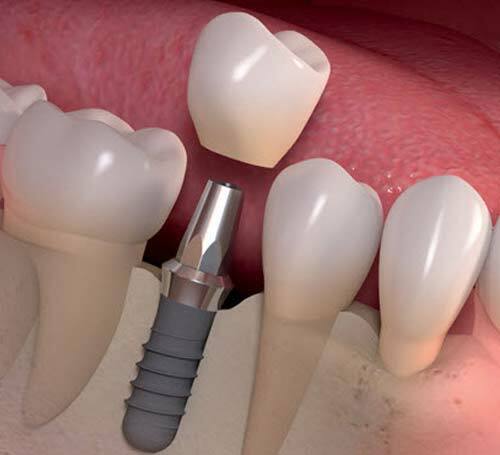 Usually, dental implant surgery carries with it low risks, which are manageable with the right care and treatment. We encourage you to discuss any concerns with our professionals at any time, before, during, or after your procedure. We are open 7 days a week and our professional dentists are on site to discuss if dental implants are the alternative you have been waiting for.